Arms’ newest character, Lola Pop, joins the roster today. With a combination of fast movement and the ability to inflate herself like a freaky balloon, she’s exciting to play but horrifying to watch. Every fighter in Arms has unique abilities that activate when they guard, jump or dash. 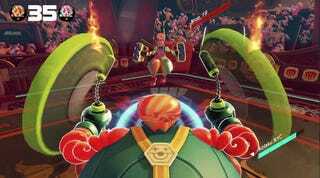 For instance, the movie star Twintelle can hover in the air or slow incoming attacks when she dodges. Master Mummy regains health when blocking for a certain amount of time. 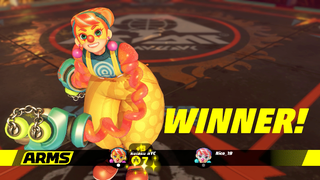 Lola Pop is a hybrid character with abilities that bolster her defense while also allowing for dynamic movement. A wacky circus clown, Lola’s main ability is to inflate her body to ridiculous proportions when guarding. In this state, she can advance forwards or backwards while keeping her guard up. But guarding is boring; leaping around like a doofus is far more fun. Luckily, Lola’s ability leads to a number of movement options that aren’t just great for confusing enemies, they’re also really fun to use. After inflating, any dodge or jump that Lola’s performs gains an extra burst of speed. This allows her to leap to large heights or leap side to side wildly to avoid enemy attacks. Mixing together her advancing guard and quick dodges can quickly put opponents on the ropes. Lola can waddle in close, bait out enemy attacks, and then launch into a fast dodge to hit blindsides. With enough back and forth movement, she ends up playing more like the dodge-heavy Spring Man than the tanky, guard-focused Master Mummy. Additionally, she is able to inflate in midair and do a bouncy ground pound. If there’s one downside, it’s the fact that the game’s default controls make it hard to guard and trigger these moves. If you want to play Lola, consider remapping guard to a shoulder button for maximum clowning around. Lola Pop’s silly toolkit offers a chance to confuse enemies while adapting to both offensive and defensive scenarios. She’s a terrifying clown that will punch you to death, but at least your final moments will be fun.